When planted around homes, trees offer many benefits. They block sunlight, helping to lower air-conditioning bills, and they reduce winter wind around homes, lowering heating costs. 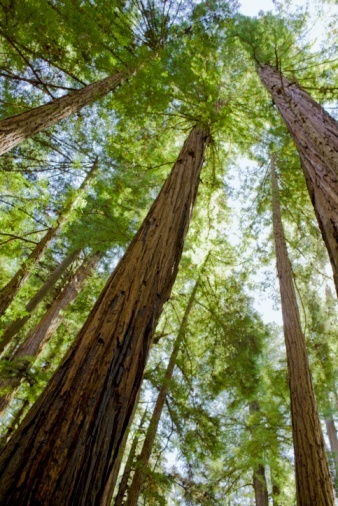 Trees can even increase property values by 15 to 20 percent. However, certain fast-growing tree species with shallow root systems can invade foundations, causing cracking, settling and other costly problems. Prevent damage by planting slow-growing trees, keeping the soil near your foundation dry and unfertilized and leaving adequate space between the house and trees. Avoid planting trees with shallow root systems near your house. A tree-root-damage study cited by the Michigan State University Extension found that oak (Quercus spp.) 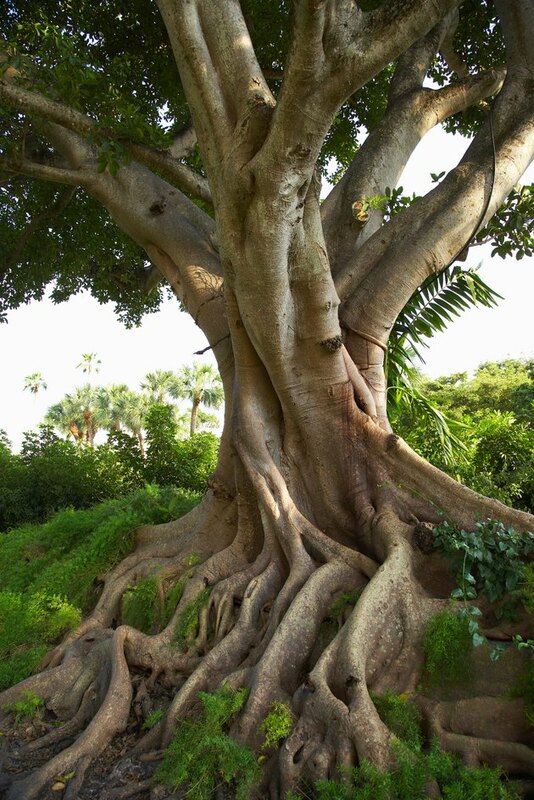 roots caused 11 percent of foundation damage, even when they made up only 2 percent of the tree population. Oaks can be evergreen or deciduous, but most species have shallow, fast-growing root systems. Especially shallow-rooted species include the water oak (Q. nigra), a 60-foot-tall tree that leaches a great deal of water and nutrients from the soil. Live oaks (Q. virginiana) also have shallow, spreading roots and canopies up to 80 feet wide. Other oaks to avoid near foundations include the 80-foot-tall swamp chestnut oak (Q. michauxii) and the 60-foot-tall Schumard red oak (Q. schumardii). Poplars, or trees in the Populus genus, can cause foundation damage. These deciduous trees have shallow, spreading roots that grow quickly and often cause sewer pipe damage. Especially aggressive rooted species include the white poplar (P. alba), a 100-foot-tall tree with a wide crown and dark foliage, and the cottonwood (P. heterophylla), a native tree that grows naturally in flood plains and has water-seeking roots. Other fast-growing, shallow-rooted poplars to avoid around foundations include the Lombardy (P. nigra), Eastern (P. deltoids), Carolina (P. x. canadensis) and Balm of Gilead (P. x gileadensis). Trees in the Fraxinus genus, commonly known as ashes, also cause a disproportionate amount of foundation damage. Commonly grown ornamental ashes include the white (F. americanus), a 80-foot-tall deciduous tree with a wide spread. The Carolina (F. caroliniana), a North American native, grows to 30 feet tall and thrives in swampy sites. The green (F. pennsylvanica) grows to 60 feet with a 30-foot spread and tolerates a range of site conditions. Many ashes grow naturally in moist or even saturated soils and have water-seeking roots. Other fast-growing, shallow-rooted, deciduous trees to avoid planting near foundations include the black locust (Robinia pseudoacacia), boxelder (A. negundo), Norway and silver maples (Acer platanoides and saccharinum), sweetgum (Liquidambar styraciflua), sycamore (Platanus occidentalis) and tuliptree (Liriodendron tulipifer). Evergreen species with invasive roots include the Brewer's weeping spruce (Picea brewerana), Crimean pine (Pinus nigra caramanica), loblolly pine (P. taeda), Norway spruce (P. abies) and Swiss stone pine (P. cembra). Why Is My Redwood Tree Dying?